Blotching is uneven coloring on the substrate, and wood is the substrate I am discussing here. There are many ways to change the look of wood – dyes, dye stain, pigment stain, and variations of both (paint, glazes, and pigment only stains primarily sit on top of the wood and obscure it some or completely, and are not relevant to this discussion). I will simply refer to using all of these as coloring the wood, since the best method to control all of them is the same. I will discuss readily known and available products. There may be some commercial/industrial products and methods that I am not familiar with, and would not be readily available to weekenders/hobbyists. Here is a great example of blotching (on the right) vs “fully” conditioning the wood first (on the left). You may want something in between, and that will be discussed. Beauty is in the eye of the beholder, right? There can also be uneven coloring from pigment stain, but I consider that a different from blotching. Uneven coloring from pigment is due to an uneven surface finish. The rougher areas grab more pigment particles, which causes more color to be seen by the eye. This is controlled by wood selection and surface preparation. in a porous, grainy wood like oak, the negative grain will capture a lot of pigment and typically be darker than the other areas. If you don’t like the contrast of the grain, you have two options – use a different. less porous wood, or use dye instead of pigment for coloring. 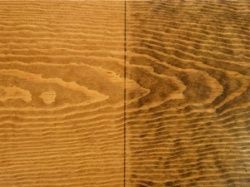 Uneven sanding, or sanding with different grits in different areas of the same board, creates somewhat the same issue as a grainy wood like oak – uneven capturing of the pigment, giving an uneven coloring to the surface. How do you control blotching? By controlling absorption, either stopping it completely or equalizing/balancing it across the wood substrate. Either method should use a clear sealer, otherwise the unequal absorption of the coloring of the sealer will simply show through as unequal coloring of the surface, which is what you are trying to stop in the first place. Completely sealing the surface requires all color to be on top. Very little coloring will be accomplished with dye unless it is used as a toner in a carrier, such as any top coat finish. Shellac is good as a toner carrier since it bonds to other finishes well, and a very light shade of shellac can also be used as a sealer. Pigments in stains will adhere to the scratched up surface of the sealer coat. There are various oil and water based sealers readily available for 100% sealing. It will be very difficult to get an even toner coat except by spraying. Wiping or brushing will show plenty of markings and not result in a very nice looking finish. This method tends to obscure or even obliterate the natural grain and coloring of the wood. Most of us want to enhance the look of the wood, not “paint” it out of the picture. So, to even out the absorption across the wood surface, something needs to partially block absorption, and ideally in relation to the absorbency of the changing wood surface. One way is to flood the surface with liquid, let’s say water or mineral spirits, until absorption stops, then let some of the liquid evaporate, then apply the coloring. This method has serious drawbacks, yet there are products marketed that work this way. For a large piece, it’s impossible to insure the right timing of absorption or subsequent evaporation. The chosen liquid must be compatible with the colorant carrier, and that can then play havoc with diluting the color in some areas and not others, and it limits the colorant carriers. A better method is to use a liquid that can be spread on the surface, and has a solids content, where after the liquid evaporates, the solids are left behind to provide the blocking of absorption in relation to the wood’s original level of absorbency. I will call this liquid with solids content a conditioner. There are three broad categories of conditioners, determined by the solvent or carrier: oil based (Stoddard, naptha, mineral spirits, etc. ), alcohol (shellac), water. Use of a wood conditioner will reduce the amount of color that stays in/on the wood vs no conditioner. Because a conditioner reduces the variation in absorption, and color, across the surface, and all or some this variation may be pleasing to your eye (grain pop, character, whatever you want to call it), there is not a “always do it this one way” process to handle all situations. Mixing ratios and # of coats can dramatically effect the outcome. Test, test, test before committing the process to a project. > Long open time to allow the wood to absorb the conditioner fully, then be wiped from the surface so that no film is left preventing later absorption of the color. > Reasonable dry/cure time. 2-6 hours vs overnight or longer. > Compatible with oil, water, alcohol based chemicals when dry. Shellac appears to be a popular choice. The issue is the short open time. It is impossible to get full absorption by the wood surface and then wipe off the excess before shellac sets up. The almost clear type works great as a 100% sealer, but not as a conditioner. Any solvent based lacquer is the same – great as a 100% sealer, no good as a conditioner (not as compatible with other products as shellac). Oil Based – I am familiar with the Minwax, Gerneral Finishes, and Varathane products. None recommend using with water based stain or dye. I believe the Minwax and General Finishes products are 100% solvent – refer to the discussion above. The Varathane product is ~32% alkyd soya solids by volume, the same oil used in their stains. It provides a long open time and will work just fine. You can also make your own by diluting an oil based poly, alkyd, or phenolic varnish by ~75% (1 part finish to 1.5 parts thinner). Experimentation is needed with DIY or Varathane on different woods to find the mixing/# of coats process. Varathane quotes a recoat time of 30 minutes, so I think an oil based colorant could be applied at that time. Alcohol based will need to wait for full drying, probably 6-8 hrs. Both the Varathane and DIY versions will put a lot of vapors into the air as all of the solvent evaporates. A shop should be ventilated with outside air during this time. Water Based – as far as I know, these products and methods are compatible with oil, alcohol, or water based dye and stain. I have used all three types with thinned WB topcoats and pva glue sizing without issue. The downside is that all of these products and methods do raise the grain. My method is to lightly sand the raised grain with the next higher grit than what was used to initially prep the surface. General Finishes, Minwax, Target Coatings, and Charles Neil have products on the market. I have not used any of them, but they are all essentially an acrylic solids content with a water carrier, similar to a thinned WB topcoat or stain base. The Target product (WR4000 stain base) is a BLO emulsion and has significantly different characteristics than the others, including not drying clear (looks like a coat of BLO). The actual solids chemical make up is irrelevant as long as it doesn’t interact with topcoats or stains. They all still work by limiting absorption as previously described. I think most of these have hit the market in the last 4-5 years. I had found thinning WB topcoats did the trick, so I never had reason to try them. Thin the WB finish 50-75% (1 part finish to 1 to 1.5 parts) with water, flood the wood till absorption stops, wipe off the excess, let dry. Don’t let it pool and dry on the surface. Testing is required to determine the best thinning ratio/# of coats for the wood and application. More than two coats will begin sealing the surface and limiting the ability to color. If the finish is $50/gal, a blotch control mix would run ~ $6/qt depending on the strength. Glycol ethers are commonly used in WB finishes, in the base product to set the proper curing, and are sold as retarders for the WB finishes. No new science there. My preferred conditioner is glue sizing, made with Elmer’s Glue All mixed 1 part glue to 4-8 parts water, depending on the application. Mixed 1 to 4, a quart is ~$2, compared to as much as $25/qt for the commercial products. It’s also cheaper than using WB finish, has a long open time, in my experience dries in the same amount of time, and dries clear (sometimes I see a bit of white haze. After sanding the raised grain and applying dye, it does not appear to me to effect the color). Application is as described in the previous paragraph. Again, test, test, test to determine the right mixing percentages etc. before using on your next project. Neil comments about glue not being a surface treatment (flaking) and refers to crackle painting. Yes to both. Using glue sizing as described, it is not a surface treatment. Properly wiped down, the remaining glue is what has been absorbed into the wood. Neither glue sizing or any reduced finish can be allowed to pool and dry on the treated surface. Using glue sizing for blotch control is not new – it’s been around for a century or 2. With any of these methods, take it easy on the sanding. I recommend doing it by hand with the grain. It needs to be as even as possible on all surfaces. Over sanding will open up the wood in that area and create the blotching you want to control. Typically a surface is sanded up to at least 220 before coloring/finishing. Sanding, different grits, # of passes, etc. is included in the testing I know you will do. I’ll “finish” with this – the commercial products work. The intent is to expand the knowledge base of those interested, remove some of the mystery and confusion about wood finishing, and save someone a few $’s. Buying a relatively expensive product solely for blotch control is not necessary, but if you’re uncomfortable with diy, been convinced by the snake oil salesmen that their elixir is somehow different and better, don’t want to mess up the project you put 100’s of hours in, or whatever the case may be, by all means use a commercial product. All of the same testing, running through the complete finish schedule with exactly the products and spraying, brushing, etc. still needs to be done. 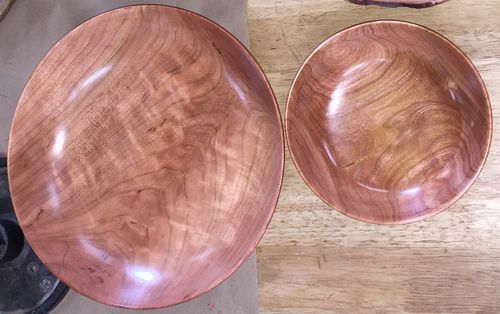 A couple of cherry bowls that were conditioned before applying a poly/dye finish. 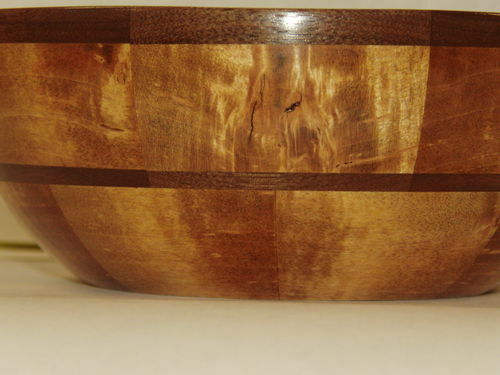 Maple & walnut segmented bowl conditioned then a poly/dye finish. OSU, thanks for a nice article. This should be required reading for most any woodworker. @OSU55 nice article. I’ve had good luck with the Charles Neil product. One of the things I like about it is that, when applying water based dye over it, if I find one area is getting too dark (from uneven dye application rather than blotching), it seems that vigorous working of the surface, close to scrubbing with the applicator, seems as if it softens the conditioner and allows me to spread the dark area and even things out. That’s just a perception and may not be accurate. I’m writing to ask, do any of your treatments behave in this way? I’m wondering if this is the glue component of Charles’ mixture. I often wonder if Charles’ conditioner itself takes up some of the dye. As a second comment, I think people fuss too much over grain raising. I’ve trained myself to ignore it. I put down water based dye, it dries, and I’m left with a fuzzy surface. The trick is to ignore it and get some finish down. After a decent first coat is on, a single wipe with 600 can be attempted, staying away from all corners and details. After the second coat is on, you can use the 600 a little more thoroughly. After a third coat, you should have a good base for sanding and, in any case, I generally find I cannot feel or see any fuzz at this point. These comments apply to water born finish, which tends to build quickly. Sometimes I wonder if my finishes aren’t as clear as they might because of the fuzz in the lower layers, but I somehow doubt it. I’d be interested to hear your thoughts (or anyones). Dark areas – cant say whether my recommended conditioners would behave the same or not. I apply dye differently, due to the issue you stated – uneven dye application. I dont like using alcohol or water only to carry the dye because it can be difficult to get it even. Instead I use a binder with some open time – I use Target em4000 stain base. I flood the surface (conditioned or not) and work the solution fairly quickly to get even coloring and finish by wiping ~ dry. Using just water doesnt work. A wb finish cut with water works, but does not have chatoyance, the em4000 is an oil emulsion that looks like blo but dries in a couple of hrs for topcoating. When using ob poly I mix dye in the poly and there is plenty of open time. Sure I get some uneveness in the color – I want some. I use toner coats of shellac to even the color to my liking. If I want perfect color I completely seal the wood and put all color on top. I find the coditioner pre-raise the grain, then I go over the surface with the next higher grit usually 320 to knock it down, and dont have raised grain after the dye. It does sometimes happen, so I will touch that area lightly with 600 then dye again. I usually dont sand wb finish till prior to the last coat. As for clarity, any sheen except gloss reduces clarity. As for only the last coat should be satin – true if you are building a thick film, but for the usual 3 coats I shoot, I dont see a difference between all satin vs only the last coat satin. Ive done side by side tests and for me it made no noticeable difference. Folks get wrapped around the axle over theory, convince themselves its true, and see a difference that doesnt really exist. I’d like to explore your methods some more. My biggest challenge is that I am only happy with the topcoats that I have sprayed. In my shop, though, I can only spray nonflammable material and, even then, as non-toxic as possible, so I spray water born finishes, usually GF High Performance and, lately, Target EM6000. The problem is that, for many times in the year, my shop is 60F and my spray area is 50F, which isn’t suitable for spraying water born finishes. So, I need to find some finishes that can be hand applied in cold / cool conditions. I used to use Arm-R-Seal, but have had trouble recently. I liked Waterlox (except for cost), but need a lower sheen. So, I’d like to review what you’ve described and see if there are some paths forward from there for top coats. It sounds like your stuff is based on Flexner. Well I guess a significant part of my knowledge base of finishes comes from Flexner, but also other books and sources as well as my own process knowledge, experience, and testing. Once you build a knowledge and experience base you can move out of the cookbook approach and create processes for individual situations. For a hand applied finish I will always start with ob poly (poly because non poly varnish is almost extinct) whether ars, minwax, or other brand. There are some minor differences but conceptually they all work the same and end up the same. Ive described what I do, so what other info are you after? You will need to do a lot of testing/practicing to get just what you want. What issues do you have with ars? It sounds like you are adding color to your ob poly, EM4000, and wb finish. One question is, what are you using to do this? TransTint? Perhaps you have not read my blog on oil and poly here, might help you understand the process better. Yes, I add color, sometimes a little sometimes a lot, to most of my projects. I find even light woods benefit from the visual grain enhancement created by faint color, usually a dark color with very low intensity. I use the dye that mixes with the finish’s solvent – transtint for water, alcohol, lacquer, wd lockwood oil for oil based. Whether a “1 step” process is used with dye in the finish or multi step with dye, toner coats, finish coats just depends on the object, intended use etc. most turnings or 1 step, most furniture is a multi step finish schedule. I most always tint a wb finish to warm them up, especially if the film thickness will be hi, they like to take on a bluish cast. Personally I dont like light woods with no color – look bleached out to me.